TRANS TOWN HALL DINNER! / CENA Y REUNION TRANS! Are you transgender, transsexual, gender-variant or an ally? Would you like to get to know other trans people and build a stronger community in DC? If so, please join us for a dinner and town-hall meeting this April! For more information, visit dctranscoalition.org or call 202.557.1951. Sponsors of the event include the Sexual Minority Youth Assistance League (SMYAL) and Transgender Health Empowerment, Inc. While non-trans allies are welcome, this will be a time for trans people to empower ourselves, so please respect our space. *To allow us to plan accordingly please notify us at dctranscoalition@gmail.com or at the above number at least four days in advance if you have childcare needs or will be requesting an ASL interpreter. ¿Eres transgénero, transexual, de genero variante o un aliado? ¿Te gustaría encontrar otras personas trans y construir una comunidad más fuerte en DC? Entonces ven a participar en una cena y una reunión con nosotros este abril. Tendremos comida y premios en la entrada. Dinero para Metro/bus y traducción de Ingles a Español va a ser disponible. Cuidado de niños disponible*. Para más información, llama al Coalición Trans, 202.557.1951 o visite dctranscoalition.org. 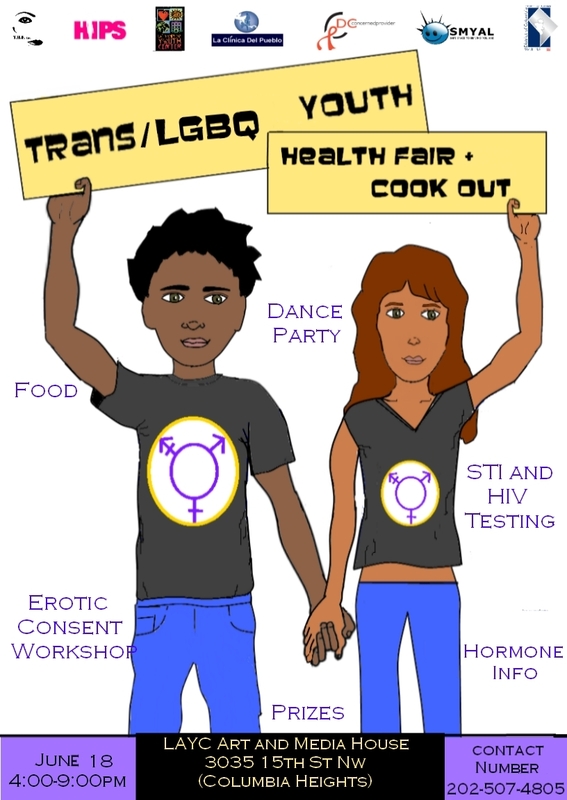 Las organizaciones que apoyan esta cena son el Sexual Minority Youth Assistance League (SMYAL) y Transgender Health Empowerment, Inc. Gente que no son trans están bienvenidos, pero va a estar un tiempo para personas trans a empoderarse. Entonces favor de respetar nuestro espacio. *Si necesita cuidado de niños, favor de llámanos (o escribir a dctranscoalition@gmail.com) cuatro días antes de la reunión. After a lot of work, we finally have finished the latest version of our Know Your Rights pamphlets! These include updates on the latest policies we have won at the DC jails, police, public schools and homeless shelters, as well as a more thorough list of local resources and more details on how to file a complaint. There are two versions – one with the full text of the human rights regulations, and a shorter one that just has our explanation of the law. Please, print these off and distribute them! You can also obtain copies directly from us. We have also been increasing the number of KYR workshops we’ve been giving to various LGB, trans and gender nonconforming communities. So far, we’ve presented our newest workshops at HIPS, SMYAL and GLSEN. (That’s a lot of acronyms!) Let us know if you’re interested in bringing us to hang out with your group! Las traducciones de nuestras libros “Personas Transgénero y Transexual: ¡Tiene derechos!” vienen pronto. David Aruquipa or Danna Galán is a Bolivian intellectual, political activist and drag artist. David/Danna works as National Director of Cultural Patrimony in the Ministry of Education and Culture, and also as a consultant on Sexual and Reproductive Rights, Youth Health and Rights, GLBT issues, AIDS, Cultural and Ethnic Identities. David/Danna will be showing a series of slides and images to discuss GLBT issues in Bolivia. Tuesday, October 20, 5:00-6:30pm, Battelle Atrium. Co-Sponsored by the Anthropology Department, the Council on Latin America, and the GLBTA Resource Center. Open to the public. Come join us for food as we talk about what’s been going on with the new DC jail and police policies that will affect trans people in the District. Learn about the changes, know your rights, and join in a discussion about our victories, ideas for the future, and how we can continue to fight discrimination! We hope to see you at the meeting if you are: transgender, transsexual, intersex, gender variant, gender queer, cross dresser, bisexual, lesbian, gay, butch, femme, androgynous or an ally. If you need help getting to the forum, or have any questions, please contact Sadie at 202-557-1951 or send us an email at dctranscoalition@gmail.com. We will have reimbursement if you need Metro fare. English-to-Spanish translation will be available. And please spread the word and bring your friends! Venga para compartir comida con nosotr@s y para discutir las políticas nuevas en la policía y la prisión que se afectarán la gente trans en DC. Aprenderá sobre los cambios en sus derechos, nuestras victorias y los planes por el futuro, y díganos como podemos continuar la lucha contra discriminación! Ojalá que Ud puede venir si Ud es: transgénero, transexual, intersexual, de género variante, andrógin@, queer, bisexual, gay, lesbiana o un@ amig@ a la comunidad trans. Si tiene preguntas o si necesita ayuda financiera para el transporte o direcciones al encuentro, puede llamar a Sadie a 202-557-1951 o enviarnos una email a dctranscoalition@gmail.com. Estará traducción de inglés a español disponible. Y por favor, ¡díga tod@s sus amig@s!